Cotton spinner - built three mills at Brownlow Fold, Bolton. Son of John Harwood, a farmer living at Lady Bridge Brow, Heaton. 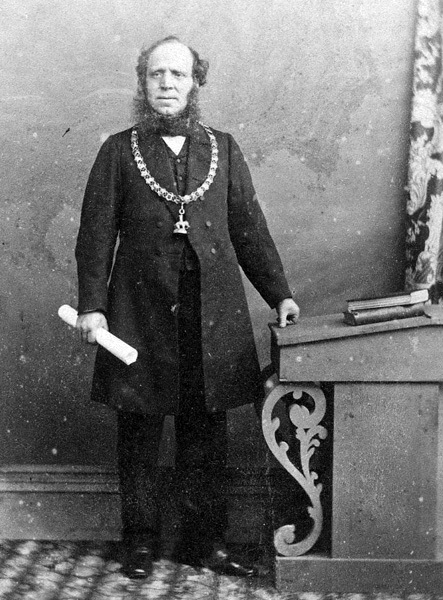 Brother of John Harwood, Mayor of Bolton 1860-61. Father of George Harwood, Liberal MP for Bolton 1895-1912. Began his career as a cabinet maker, upholsterer and undertaker at 20, Silverwell Street. He went into partnership with James Taylor at Brownlow Fold Mills. In 1864 he severed the partnership, the company then becoming Richard Harwood & Son. Represented Church Ward 1853-62. Alderman for West Ward 1862-74. He was Chairman of the Markets Committee for 7 years and laid the cornerstone of the Fish Market. He cut the first sod for the construction of Bolton Corporation's Wayoh Reservoir at Turton. He was President of the Mechanics Institute 1867. He established Brownlow Fold Institute. He was a supporter of Luke Boardman's Ragged School and when he became Mayor the children there presented the Mayoress with an embroidered picture of the school that they had made. He was described as being an "Ardent worker for the cause of the working men" and over 5,000 of them collected money for a portrait of Harwood in his Mayoral Robes, painted by T Walley. An advocate of Free Trade, he was a frequent speaker on the reform platform and in the Temperance Hall. He later moved to Pendleton and became a member of Salford Council. 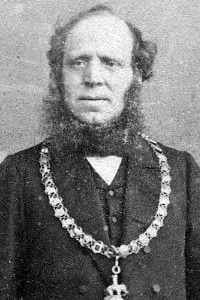 He was also Alderman and Magistrate for Salford from 1876, serving as Mayor of Salford 1873-76. As Mayor of Salford he was presented with a sword by the Sultan of Zanzibar. A bust of Harwood was placed in Salford Council Chamber in 1878. He was a Unitarian, attending Bank Street Chapel and was Chairman of East Lancashire Unitarian Mission and later North East Lancashire Unitarian Mission. His wife, Alice, was Mayoress. Formal portrait of Richard Harwood as Mayor of Bolton. 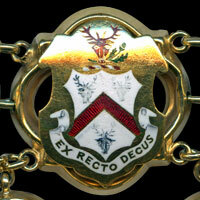 Richard Harwood's link on the Mayor of Bolton's Chain of Office.